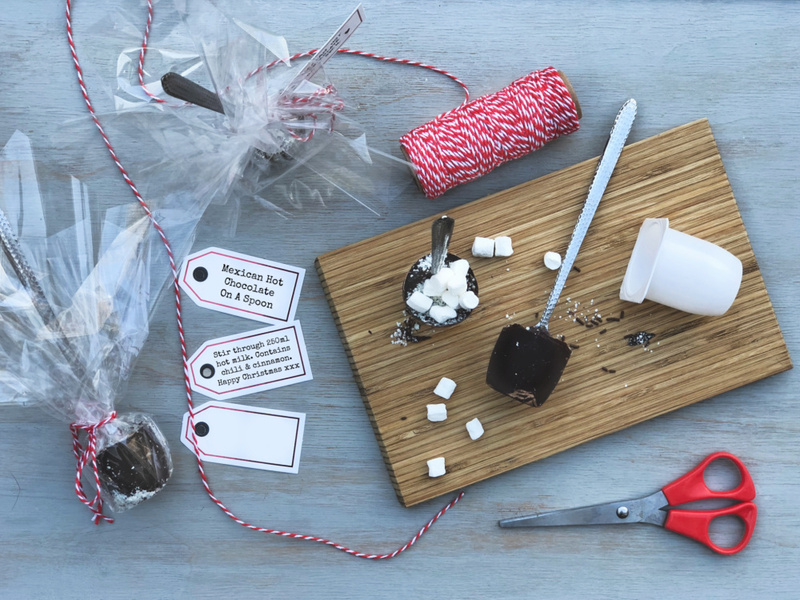 Hot chocolate on a spoon is a nice little craft to do with kids in the run up to Christmas. They also make cute gifts wrapped in cellophane tied with colourful ribbon or cord. This year I made a Mexican version of hot chocolate on a spoon to give as gifts. Mexican hot chocolate is made with dark chocolate, cinnamon and chilli. It’s rich, comforting and delicious - the chilli feels like it’s giving you a warm hug (don’t be scared of chilli in hot chocolate, it’s amazing) and the cinnamon adds another level of flavour. Adding a pinch of salt brings out the sweetness of the chocolate (don’t be scared of salt in hot chocolate either - it really works) because salt negates bitterness in the chocolate. You’ll be surprised how sweet this Mexican hot chocolate tastes without any sugar. It’s really easy to make Mexican hot chocolate on a spoon - you just need to have a few things to hand. You’ll need some spoons (or wooden lolly sticks if you prefer) I used some long latte spoons, but wooden spoons look very cute. I spotted some enamel spoons and some heart shaped spoons on eBay which would be make it an extra special gift. To melt the chocolate I find it easier, quickly and less wasteful to put it into a heavy duty zip lock food bag and put the bag into a bowl of boiling water to melt. When it’s melted you can snip off one of the bottom corners to make a sort of piping bag. This method works well for smaller quantities of chocolate. It also works for larger quantities of chocolate but you may need to replace the boiling water if it turns lukewarm before the chocolate has fully melted. If you’re not happy using the chocolate-melting method with a food bag you could melt in the microwave (in short bursts stirring well in between) or using the traditional bain marie method if you prefer. Melt the chocolate in the way you feel most comfortable. You’ll also need something to use as a mould for the chocolate to set in. You can use ice cube trays, but I like to use the little 50g fromage frais pots because 50g of chocolate in 250ml of milk makes the perfect hot chocolate. Brush the moulds with a tiny amount of oil - it helps them getting stuck in the pots. It’s not essential, but adding a few sprinkles or mini marshmallows to the top of the chocolate, in the pot before it’s set, will make your Mexican hot chocolate on a spoon look really pretty. White mini marshmallows and grated white chocolate give a Christmassy feel. Finally, if you are giving these away as gifts, wrap them in cellophane (I used 30cm square pieces) and tie with some cord or ribbon. Adding a tag looks pretty and is a good place to write the instructions “stir into 250ml of hot milk” and also the ingredients of the Mexican hot chocolate on a spoon, incase of food allergies. If you have a nice mug to give to someone as a gift nestling a cellophane-wrapped Mexican hot chocolate on a spoon makes it extra special. I found these gorgeous little Kilner jar mugs which I’m using as gifts for teachers this year with a Mexican hot chocolate on a spoon inside along with a candy cane. 1. Break the chocolate into squares and put inside the food bag along with the chilli, cinnamon and salt. Try to get as much air out of the bag as possible and lay it in a shallow bowl (like a pasta bowl). Pour boiling water over the bag and leave to melt. While it’s melting, brush the inside of the fromage frais pots with a tiny amount of oil. 2. When the chocolate has completely melted, take it out of the water and place on a tea towel to dry it. Hold the top of the bag with one hand in the air and with the other hand, scrunch the bottom of the bag a few times to make sure everything is well mixed (careful, it’s hot). Squeeze all the chocolate to one corner of the bag and snip of the corner to make a sort of make shift piping bag. Use the piping bag to equally fill each of the fromage frais pots with the melted chocolate. 3. Carefully put one spoon into each of the chocolate filled fromage frais pots. Put the pots on your kitchen counter right up against the wall to the top of each spoon can lean against the wall while the chocolate sets. 4. If you wish to (at this point while the chocolate is still melted) you can sprinkle some marshmallows, sprinkles or grated white chocolate onto the top for decoration. When the chocolate has set, transfer to the fridge to completely harden. 5. Remove the pots from the solid chocolate (pull slowly, they should come off easily) and you’ll be left with a soil lump of chocolate on the end of your spoon that you can stir into a mug of 250ml of hot milk to make a delicious Mexican hot chocolate. 6. If you wish to give them away as gifts then wrap them in a square of cellophane tied with colourful ribbon or cord. Attach a tag explaining what is, what the ingredients are and how to use it.